I’m not sure if others use their spare bedrooms like a storage room. It was actually cheaper for me to rent a second bedroom as opposed to renting a full storage unit. As I move the final carloads of stuff over to the new place, the shelves aren’t filling up as quickly as they did over at the old place. Is that because I still haven’t moved over everything? 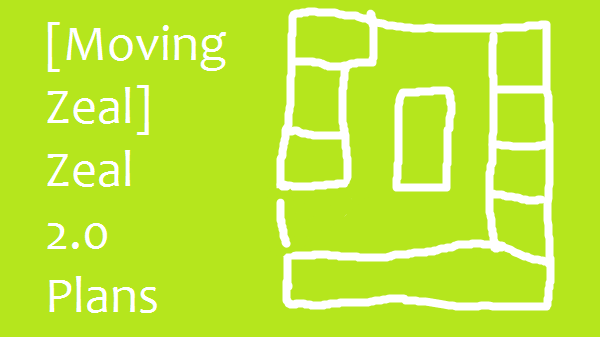 I imagine once everything is under one roof, then I’ll feel more comfortable about downsizing things I don’t need. I might keep the boxes and such, but there’s no way I’m going to feel interested in collecting stuff. I passed on some free trading cards this evening. Over the next year, I intend to go through every box of every possession I own and either repack it or sort it out to sell or donate. It’s been a terrible odyssey to move all this stuff. The next time I move, I’ll go off the example of one of my friends that helped me move: If it can’t fit in a big moving truck, it shouldn’t go. If you know what you have, you can more easily decide to keep or toss. Do you keep stuff out of interest or obligation? Ideally, each shelf would have a particular focus. That way, when I assess my collection of VHS tapes or clothing, I can bring out everything all at once to my former sorting table, now the dining room table, dump it all out, organize, and condense. If I get the most happiness while writing, which requires time along with certain resources including going to events or research, then I shouldn’t be spending more time than I must with secondary or tertiary hobbies. If I want to watch a tape, I should know exactly where it is, and I shouldn’t have any friction watching it. Otherwise, there’s no point to owning it. For now, the shelves line the wall with reckless abandon. No point being overly organized while I’m still moving stuff over. Once I get everything under one roof and find that I’m not using some shelves, I’ll break them down, and won’t reuse them. 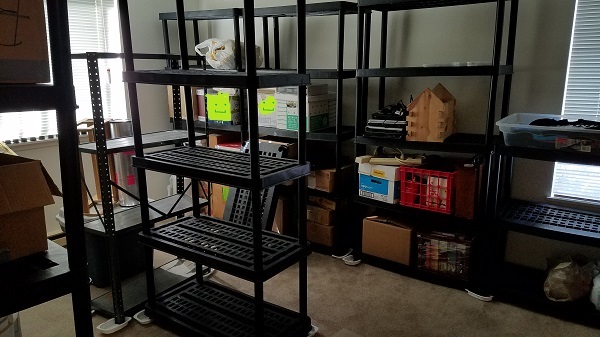 Just like how I reduced surface areas in the old place until it emptied out, I’ll do the same for the new place, until the shelves in the spare bedroom can be replaced with office furniture, then I’ll be able to design Zeal 3.0 as a physical location. Until then, I’m OK with having a storage room instead of a proper writing office. Inspirations: I’ve been photographing the progress and the new place doesn’t look as messy as it could, in part because I’ve been using the spare bedroom as a warehouse. I wanted to convey this idea. It might have been too rambly, but I’m not sure if there’s a way to write that other than a sterile “use these shelves, place items in shelf, and you are good.” Since the overall intention is not to be permenant with these shelves, this is a nice move-in feeling of confidence over using the space well. We’ll see how it goes. Above: A rough blueprint sketch showing the shelves lining the walls. Below: An early photo showing that.